Unit designed to accept and discharge 55 gallon drums without dust emission. Unit has a 1,500# capacity and is caster moveable. Unit has a 120” discharge height with a 21” discharge projection. 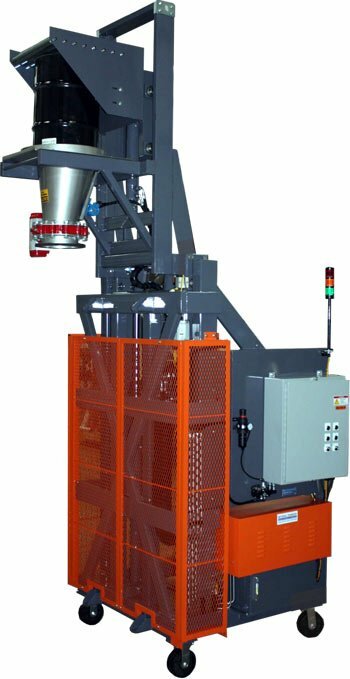 Loading skip base features a gravity roller conveyor and drum alignment system for proper sealing to pour cone. Lift & SealTM system seals drum to pour cone for dust-tight operation. Dual patented Control LinkTM Rotation System inverts drum for maximum product discharge safely and efficiently. Pour cone features a 10″ diameter pneumatically actuated butterfly valve with a stainless steel disc and discharge nozzle. Carbon steel is cleaned and custom painted with an industrial Durethane finishing system. Premium quality Parker 5 GPM hydraulic system for reliable operation.